The MJC will, on Thursday, 9 March 2017 receive cyclist Azaar Vadi who is cycling from the northern part of South Africa to the Southern most tip of Africa. 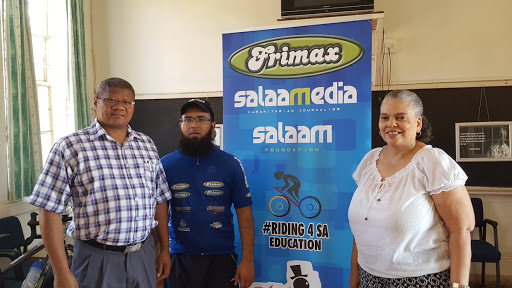 Vadi is cycling to raise much needed awareness about the condition of education in South Africa. Vadi has received widespread support and admiration for his initiative and has identified the MJC as one of his stopping points on this historic initiative. The MJC is extremely honored to receive Mr Vadi and wishes him well for the complesion of his journey and success for his initiative.